1. Create an account here and sign waiver. 2. Once account is created and you are logged in, click "edit" in the "Personal" section. Click the drop down arrow next to "notification preference" and select "email and text messages" so we can notify you when you get into class (much easier than checking your email). 3. Download our mobile app to your Iphone or Android here and log in with your account info you just created. 3. Open the app and select "Buy Services" and select the "New Babe Special" (3 classes for $20, good for 30 days). Enter your credit card info to purchase. You must purchase a class before you can reserve a spot at the barre. 4. Go back to the main menu and select "schedule" to start reserving your spots. See "Booking" section below for details. 5. Request membership to our Garage Barre Babes private Facebook group You already know we're about the community. This is where a lot of the fun takes place! Don't miss out! 5. 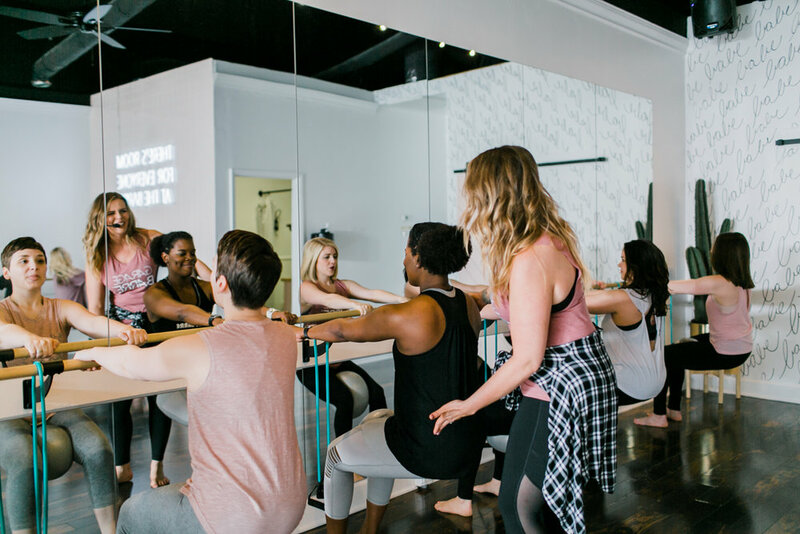 Once you've used up your New Babe Special classes, our prices don't drastically skyrocket (we know you have other bills to pay and we sure love having you around). Become a Super Babe member for only $65/month (best deal) or check your other options here. After you've purchased your classes, you may book you spot at the barre. You are always welcome to just show up to class -- there's a good chance you'll get in (if you like taking risks). If you're not a risk taker and planning is your thing, go ahead and reserve your spot at the barre. Some classes may say "waitlist" next to them, see "Waitlisting" section below for details and go ahead and book those waitlisted classes -- hint hint, you'll get in!! If you cannot make the class you reserved, make sure to cancel your reservation or waitlist 4 hours before the class begins or your purchased class will be removed from your account (it's our least favorite thing to do but we need to be sure to make room for all of the babes). Sigh. Class is full and now you're on the waitlist. Well, perk up, because we have a secret...the waitlisters usually get dropped into class! As spots open up, the waitlisters are dropped into class in order of sign up time. You must purchase a class before you can reserve a waitlist spot. If you don't get dropped into class, your class will be returned to your account to use for another class. Please note, we assume that you want to attend every class you are waitlisted for. If you do not remove yourself from the waitlist (online or through the app) 4 hours or more before class begins, it will be too late to cancel and your class will be removed from your account. Please only waitlist for one class, you WILL get in. Also, we don't offer the option of "switching" classes. If you are scheduled for one class and get added to another class from the waitlist on the same day, you will be charged for both classes. Can't make class? Serious Bummer. Just make sure to cancel your reservation (online or on the app) 4 or more hours before class begins to avoid your class being removed from your account. If you cancel in time, your class will be returned to your account. We are super low key at GB. Leggings and a tank or tee is just fine. Some prefer shorts, just know we lift our legs up a lot so you may not want to go commando. You can wear sticky socks or go barefoot. If you have plantar facitis or any foot trouble, you may even wear you sneakers. All you need is yourself, some water and a towel (if you want). We provide all of the equipment. Make sure to arrive at least 10-15 minutes early your first class to ensure the instructor can show you the ropes. This is also the time to let them know if you have any injuries that require modifications. This is SUPER important! Please don't wait until after class to tell them. We want you safe!